Technology often displaces humans in organizations as a representative to customers. How does the use of computer technology instead of humans to represent an organization change customers’ feelings and behavior toward that organization? 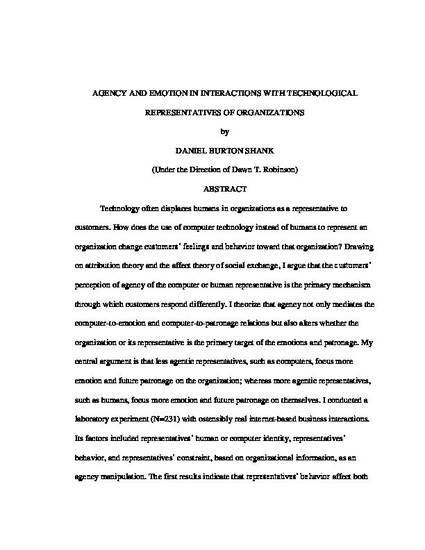 Drawing on attribution theory and the affect theory of social exchange, I argue that the customers’ perception of agency of the computer or human representative is the primary mechanism through which customers respond differently. I theorize that agency not only mediates the computer-to-emotion and computer-to-patronage relations but also alters whether the organization or its representative is the primary target of the emotions and patronage. My central argument is that less agentic representatives, such as computers, focus more emotion and future patronage on the organization; whereas more agentic representatives, such as humans, focus more emotion and future patronage on themselves. I conducted a laboratory experiment (N=231) with ostensibly real internet-based business interactions. Its factors included representatives’ human or computer identity, representatives’ behavior, and representatives’ constraint, based on organizational information, as an agency manipulation. The first results indicate that representatives’ behavior affect both emotions and patronage as predicted by the affect theory of social exchange. Further, computer representatives alter these processes on patronage and some emotions. Second, organizational constraint alone affected customers’ perception of representatives’ agency, yet it also interacted with computer identity to affect perceived agency. A final set of results signify that both representatives’ computer identity and perceived agency affected customers’ focus of emotions and patronage preference, but in opposite directions. Greater agency of the representatives produced a stronger focus of emotions and patronage on the representative as opposed to its organization – this included both positive (negative) emotions and more (less) patronage after a positive (negative) interaction. Computer representatives, often seen as less agentic than human representatives, produced the same effects associated with high agency: stronger emotion focus and patronage behavior. This leads to a non-intuitive conclusion: even though computers may be less agentic than humans, computer representatives shield their company by receiving stronger positive or negative emotions and the associated future business. © 2012 University of Georgia, All rights reserved.